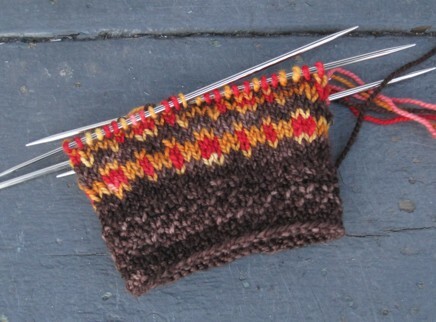 Even though I've been pretty obsessed with other things, I'm still working away at the sock sweater. At this point that translates to endless rounds of stocking stitch with occasional, invisible decreases all worked in brown, making it not so much of a candidate for thrilling photography. after all the bus and car trips I've been on since the last time I wrote about it, I'm getting closer to interesting. I'm employing my idea to do a lot of the lower body in one hand-dyed skein, then alternate with a second for a few thousand rounds so the join isn't terribly noticeable. You can see there in the upper right corner I'm finally coming to the end of that first one, whew! 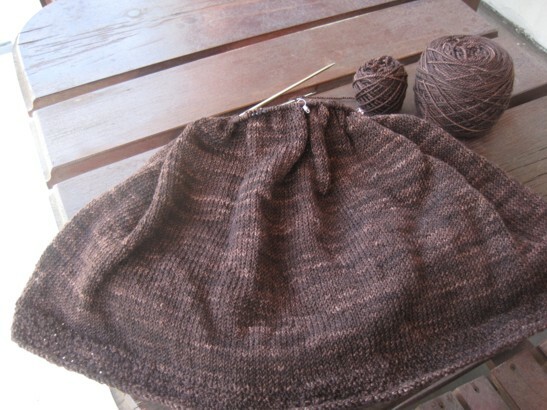 Of course, that means I'm also getting a lot closer to the top of this sweater, and more urgently that I'm carting around a lot of bulk, contrary to Travel Knitting Guidelines. So I figured it was time to set up the second segment of travel knitting. Just a couple more rounds and I'll be done with the patterning on this first sleeve. After that, it might as well be the leg of a sock - totally travel-with-able. Hope you have a marvelous weekend with knitting in it, portable or otherwise! What fantastic colours for the pattern! You have a great weekend too! Oooo its so fun to be following a new (to me) knit blog and peeking into new projects along the way!